I've seen a Philips top loader regularly walk itself forwards especially with an unbalanced load, it was more like stamping than walking, but that was 30 years ago. The machine would sometimes hit a very low resonant frequency on a spin cycle and would rock back and forth and go for a short walk. Nowadays most manufacturers have put a bit more effort into the mechanical design so washing machines don't vibrate as much but they are are still going to vibrate tangentially to the spin axis, it's unavoidable. It looks like a very clever solution to a problem but I'm surprised at the low price for four force transducers and the control hardware, maybe they're selling it at the projected high volume OEM price ? I haven't been able to find the patent application and Elmac Srl is a legit company, also, a demo video with a real washing machine would have sold it for me. I'm not going to buy one but I wish them good luck. As far as "walking" washing machines go you only have to damp out the very low mechanical resonant frequencies at around lets say 1Hz or so but can the force tranducers deliver enough energy to damp the mechanical system ? Maybe they can because you can harvest energy from the transducers that have an applied force and dump that energy back into the system. How do you stop a large mechanical oscillator from oscillating it's not something you do every day. So its not clear to me, but appears to be four actively controlled transducers, for 45 euro is definitely super cheap. It can be a problem, but more of a minor annoyance, washing machine moves around by itself after spin cycle, and have to push it back. But this could be solved almost as well with a thick rubber mat. This is a piece of crap. IME if washing machine is vibrating a lot, that means either legs are not leveled or floor is not firm. This thing won't be able to do anything with that (if was real to begin with). The only real fix would be something like a block of concrete or something else heavy. Or of course machine itself may have worn out dampers inside it too. Why videos do not show 50+ kg load standing on it? It's an actual problem (a toploader captive writes). Not sure this is a fix, though - usually I just go out somewhere so a) it''s not my problem and b) the stuff is hanging up when I get back. I think they've missed an important aspect: many, if not most, washing machines are front loaders and are designed to fit under a counter (or the fitted kitchen is designed to accommodate a standard washing machine). Jacking it up a few inches is going to have it pinned to the counter (if you can get anuything at all under it). Nevertheless, if that lead video isn't faked it seems to do the biz, does it not? Must be several brownie points for just thinking this one up, and then getting it work. I guess it's not that much difference to active suspension in a car, just that the road is smooth and the passengers jumping around. Well, thanks a lot, Mike. Absolutely no need for this but I just pledged for one anyway. Back when I was a young, just left university fellow I shared a hose with another engineer. We had an old top loader that one of the agitator fins broke off. We didn't have enough money to replace the part (well we did but we had other priorities) and so for some time we just carefully arranged the washing to enable the spin cycle to complete. The problem was that if the load got out of alignment the wobbling tub would trigger the machine to shut down. As engineers we considered the problem, had a beer or two, considered some more and then decided that the appropriate solution would be to disable the tub sensor. This worked great until one I got home and I found my housemate shoving at the laundry door (it was an outside laundry, we lived in an early 1900's house in North Ryde) - Looking through the window we could see that the machine had walked it's way all the way to the door just at the limit of it's hoses. Had to feed my mate through the small window so he could wrangle the machine from inside. Our solution was clearly to electrical tape the hoses so that they would be much shorter and the machine couldn't reach the door. I don't remember if we ever replaced that machine. Restraining the machine by the hoses? You're lucky that the hose or fitting didn't fail and flood the place. Should have substituted a shorter power cord so that it would unplug itself before it got too far away. Separate building, not connected to the house with a concrete floor, brick walls and cast iron water pipes. We weren't concerned about flooding and we didn't want the washer to stop. Maybe it's intended for the North American market? 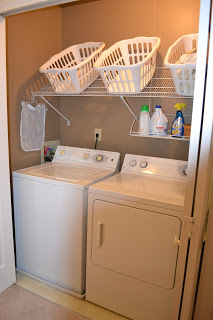 Washers here are very rarely in that configuration, occasionally you see the compact European style washers in high end apartments but the typical American washer/dryer sets are considerably larger than European/UK units and are typically freestanding in a utility room or closet. It's common for newer front loader types to be placed on pedestals that raise the machine up a foot or so to make loading easier and provide storage below for detergent and other supplies. That said, it seems like a solution looking for a problem. If the washer is walking around the room it's likely the leg levelers need adjusting, there's a fault with the machine, or it's being overloaded. For special cases, a strategically placed hunk of iron or concrete in the bottom of the cabinet or some brackets to screw it to the floor seems like a much simpler way to reduce vibration. With the internet around there's no need to take my word for it. Incidentally this is one of the things I found interesting when I visited England, the friend I stayed with had his washer in the kitchen like you describe which is something I had never seen before. Made sense given the overall smaller scale of everything. Washer, fridge, dishwasher, cookstove, it was all tiny compared to what I was used to seeing. 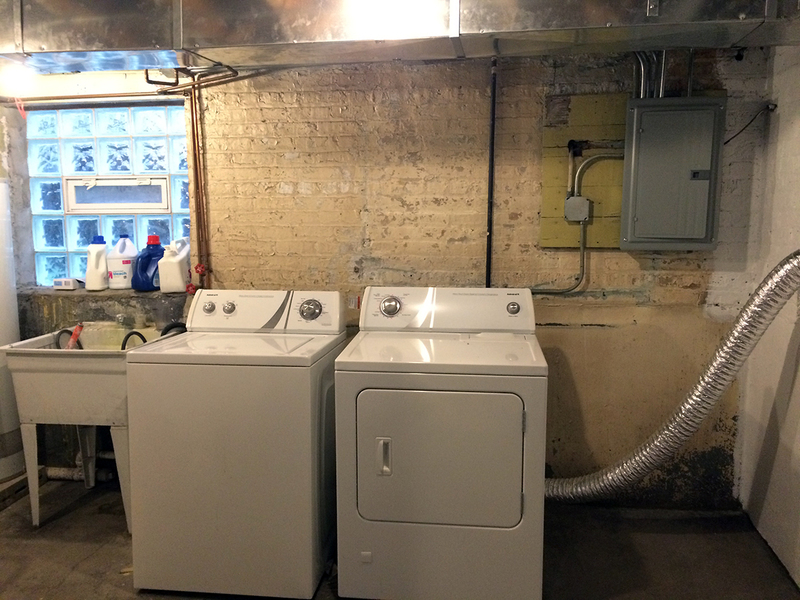 I was also surprised to learn that most people there have no dryer although he had added one in a closet. There's an elegance to using a clothes line outside to dry but you don't see that much here these days, a lot of HOAs don't allow them (I won't get started ranting about HOAs) but either way I don't think I've ever seen a home in the USA or Canada that didn't have both a washer and dryer or in the case of some apartment complexes, access to shared laundry machines. That may explain why the average household here uses around 4000kWh/yr whereas in the US it's 11000kWh/yr - all those dryers chugging away, no doubt. Not to mention that we're averse to them on account of they have a habit of burning down blocks of flats. I have no idea how the average household uses so much power, I guess people overall are just rather wasteful. Even with an electric dryer I average around 4,000-6,000 kWh/yr. My heat is natural gas though, if I had electric heat my electricity consumption would be far higher. This dampening device seems to only be effective for the side-loading type washers, where forces of an unbalanced load are directed vertically for the most part. This type of device would seem to have absolutely no effect for top-loaders, where forces are horizontal. As for "walking", that seems to be a bigger problem for the top loaders where the drum rattles back and forth sideways and causes the machine to move horizontally. This was a problem for some earlier top-load Samsung (Samsuck!) machines that would shake themselves apart and brake the struts that hold the drum-holder in place. Since then, stronger joints/struts and a wobble-detection mechanism cause the machine to stop, do a few back and forth jiggles to try and rebalance the load, and also gently turn up the speed to see if the balance goes off. If it goes past some threshold it will shut down the machine to allow for user intervention at least (a safety feature). As far as side-loaders go, I've never seen it be such a problem as usually at the beginning of the spinning the speed is slower and gravity will tend to mix things up a bit more until things even out. I suspect that an unbalance in side-loaders though can still occur sometimes that is over the safe limits... but I would like to see when and how that happens, and what the dampener really does. I'm not talking about throwing a brick into the machine.... I'd like to see real-world scenarios, like putting ONE ITEM in there (like a pillow) that will soak up a huge amount of water and will never actually be able to be balanced. Unfortunately the videos shown do not give us enough information about that. Neat device though. I've always thought about why there couldn't be 6 or 8 weights distributed around the drum on screw-gears that could be made to be closer or further from the central axis of spin and be adjusted "on the fly" by a computer to try and balance loads that way, with sensors that feedback vibration and an algorithm which adjusts the weights accordingly to minimize it. There are some systems to adjust the balance in some cases - however the system is quite a bit simpler, directly driven from the vibrations. However the adjustment is limited. Walking machines is a problem with front loaders as well, though maybe less. I remember a story similar to that of Tony_G from times before there were sensors to stop the machine. AFAIK the system with redistributing the loading works reasonable well, most of the time. Worst case the machine stops with an error once every few years. Slightly inconvenient, but not that bad. Our toploader has a vertical drum. Forces are exactly the same as a front loader, except front to back instead of side to side. My front loader has a surprisingly simple sensor for drum balance, it's a pin switch like the sort that would be used to sense when a door is closed. If the drum bounces too hard the pin switch mounted to it hits a stop and activates. The machine rocks the drum back and forth slowly several times then tries the spin cycle again. I don't think I've ever had it error out in the ~12 years I've had the thing. Who's going to be the first to decode the FSK signalling in the video?